Amber and I have a small backyard flock. 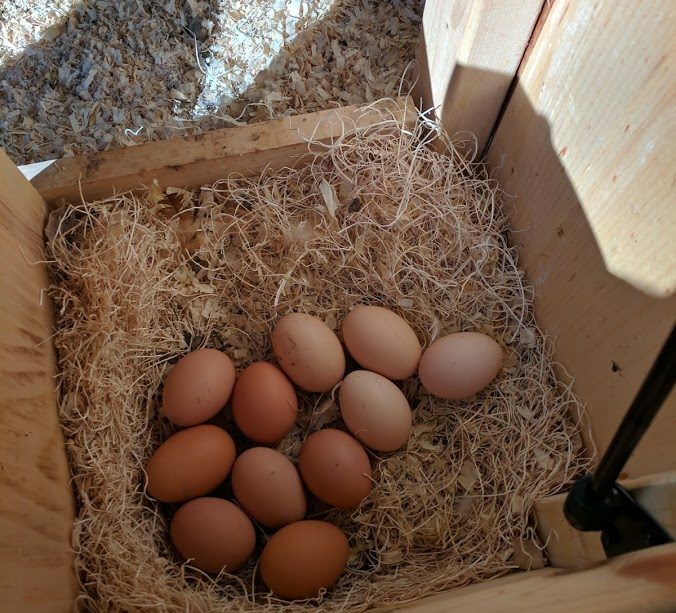 From time to time, we get an egg surplus and like to share with neighbors. To make the process easy, we setup an automated system at our house. Please send me a text/email/or PM on Nextdoor for the address and how many you would like. Assuming we have extra, I will put some out for you. Just leave the money in the envelope. Drive down our driveway to the front of the garage. It’s a long driveway with a circular turn around so you can easily get in and out. Look to the right of the garage and go down the little walkway to the brown outdoor storage box. Open the box and you will see a cooler, with the eggs inside. It’s a cooling cooler so it will keep the eggs nice and cool. Please leave your money ($4/dozen) in the envelope. My office is above the garage, so if you hear dogs barking, don’t be alarmed. I work from home, so you might see me out and about, otherwise, feel free to pick up your eggs and head out.